First of all, I’m back. I had a baby (another! ), sold my apartment, and moved at 9 months pregnant. I won’t bore you with the details but I wish I was the kind of person who could manage to blog through all this. I am not. Chicken Scarpariello, or affectionately known as “Chicken Scarp” is a staple in any self-respecting red-sauce joint or family style Italian-American establishment. I’ve been eating it a lot lately and of course I wanted to make it at home. There are many variations of the dish but it is generally chicken and sausage braised in some kind of acidic sauce served with potatoes. It is definitely one of my favorites. You can make it with spicy or sweet peppers, depending on your family’s taste. I leave the spice out and then put chili flake on mine so that my daughter can partake. This is a basic recipe, but I have also seen it with broccoli added to make it a complete meal. All you have to do is blanch the broccoli in salted water and then toss it in at the end and it’s delicious. 2. Toss potatoes and 4 garlic cloves in initial 2 T of Olive oil. Season with salt and pepper, lay out on a sheet pan or cookie sheet and roast 20 minutes. Turn potatoes and roast another 10 or so minutes, until soft and caramelized. Hold them until you need to add them to the recipe. 3. Heat remaining 2 T in a shallow wide skillet with a lid. Season chicken pieces with salt and pepper. When oil shimmers and lets of the slightest bit of smoke, add chicken pieces, skin side down. Don’t crowd the pan, rather do batches so that the chicken browns properly. Once you add the chicken to the pan, don’t disturb it- let a crust build on it before you try to turn it or it will stick. Brown chicken on all sides and remove, reserving in a bowl. Brown sausage as well, getting nice color on all sides and reserve to same bowl. 4. If there is just a ton of fat, pour some off, leaving about 2 T inside. Add garlic and peppers and sauté, until they just start to color. 5. Pull pan off the heat. add vinegar and return to heat. Scrape bottom of the pan with wooden spoon to release any stuck bits. This is called deglazing. Reduce vinegar by half. Add chicken and sausage back into the pan. This, unlike the browning phase, can be a snug fit. Add bay leaf and chicken stock so that it comes about 3/4 the way up the sides of the chicken. If you have made your own stock you will need to add some salt at this step. Just add a little, you will taste and adjust later. 6. Bring to a boil then reduce to a simmer. Cover. 7. Simmer until white meat is just done, about 12-15 minutes (depending on the size of the chicken). Don’t worry if it is a little under because it will continue to cook while it is being held and you are going to put it back in the pan and cook it a bit more too. Remove white meat to a bowl and cover loosely with a damp towel or plastic wrap to reserve. Remove sausage and let rest for a few minutes. Then slice sausage and add it back to the pot. 8. Continue cooking dark meat until it pulls off the bone easily. 9. When dark meat is done, remove the cover and adjust sauce. If you need to reduce the sauce a bit do it now. Just remember that salt will concentrate as you reduce so don’t season fully until the end. This dish should be juicy and saucy, not dry or with a thick gravy. 10. 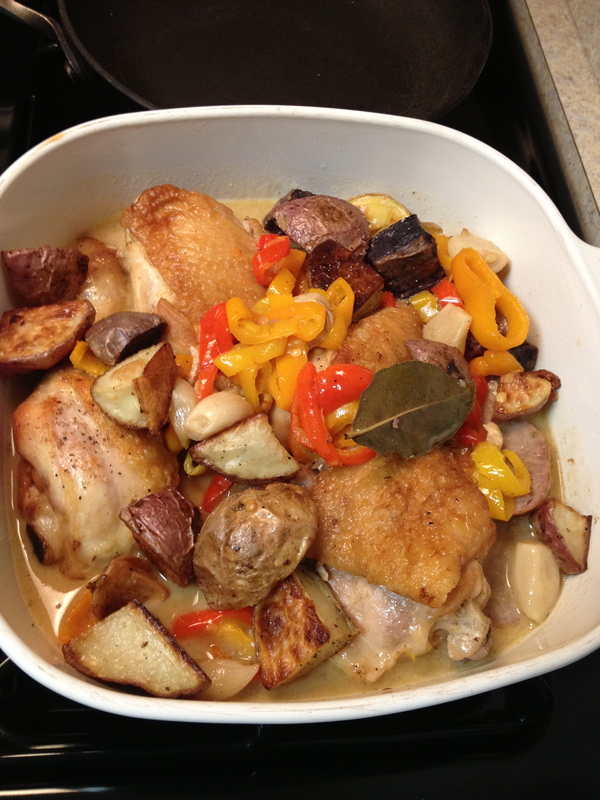 Return white meat and potatoes to the pan and heat gently so that the flavors marry. If you are adding blanched broccoli do so at this point. 11. Enjoy! Leftovers of this are great because the chicken really marinates in the sauce. *I make my own chicken stock for this recipe. Since you are cooking chicken on the bone anyway, you don’t need to go crazy on the stock, as the chicken itself will also add to the sauce. Just take the wingtips and backbone, place them in the smallest pot they will fit in and cover with water. Make this be the first thing you do. Bring it to a boil, then reduce it to a simmer. Using a spoon, take out the impurities that will rise to the surface (greasy and scummy looking stuff). While you prep the rest of the ingredients, this will cook and by the time you need it for the recipe it will have cooked long enough.